This project is research carried out at research group Software Construction, RWTH Aachen University, Germany. It is a project comprising four parts aimed at improving model reuse by means of model recommenders. 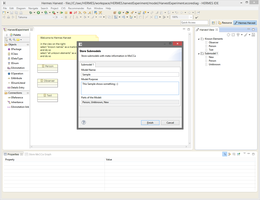 The concepts are held generic but implemented in the Eclipse Modeling Tools Environment and UML/EMF(Ecore). The harvest component maps to the hermes.harvest.mmf (model mining framework) plugins. It comprises of a framework which helps identifying beneficial parts of models for model libraries. It always works in combination with a model library. 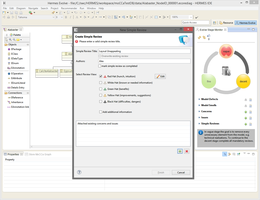 The evolve component maps to the hermes.evolve.mef (model evolution framework) plugins. It comprises of a framework which can be served by different back ends and offers quality guidance for model evolution in model libraries. The reuse component maps to the hermes.reuse.mrf (model recommender framework) plugins. It comprises of a framework which can be extended by recommender strategies, user interfaces, and contexts. 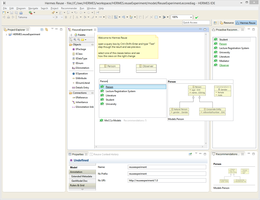 The store components offered by the hermes.store.mdf (model data framework) plugins comprise different kinds of model libraries. Simple folder, local database, ftp, or remote graph database are offered.